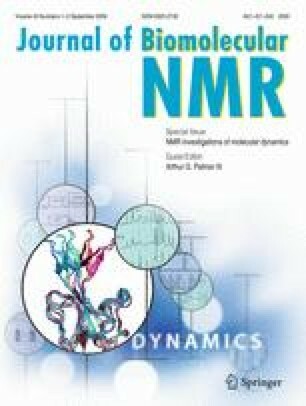 A 3D NMR technique is described which correlates the amide proton and nitrogen resonances of an amino acid residue with the Cα chemical shift of its preceding residue. The technique uses a relay mechanism, transferring magnetization from15N to13Cα via the intervening carbonyl nucleus. This method for obtaining sequential connectivity is less sensitive to large line widths than the alternative HNCA experiment. The technique is demonstrated for the protein calmodulin, complexed with a 26 amino acid fragment of skeletal muscle myosin light chain kinase. a 26-residue fragment of the CaM-binding domain of skeletal muscle myosin light chain kinase comprising residues 577–602.